When people ask what I write, I usually reply: nonfiction, personal essays, and memoir. When I describe my current project, I say I’m writing a memoir that braids leadings about my work with the story of the two years my family and I lived in a remote mountain village. After a break from MFA classes and my job, plus a renewing family vacation, I’m eager to resume work on my own spiritual memoir. Writing the Sacred Journey will be a good companion. I`m excited to read your next book. Abrazos, Jeni Ali. Thank you for this. It touched more than I necessarily have easy time to work with. The book sounds interesting. I can seewhether the library will have an e-book version. I am finding myself with a peculiar testimony about refusing to buy things that are only available in print because I cannot read it independently. I KNOW publishing economics are punishing especially for small presses and I am not clear what makes the most helpful path for alternative formats. But I am clear I want to read the book. I am not williing to buy it in print. Jeni – Thank you for the quote from Frida Kahlo. I just visited her Casa Azul in Mexico City. Inspiring to be within touching distance of her pastels, oils, brushes, and easel. RantWoman, you make a good point about the accessibility of e-books. 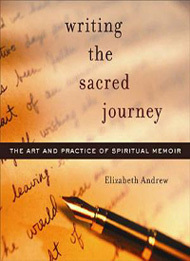 I hope you can find “Writing the Sacred Journey” in an electronic form.